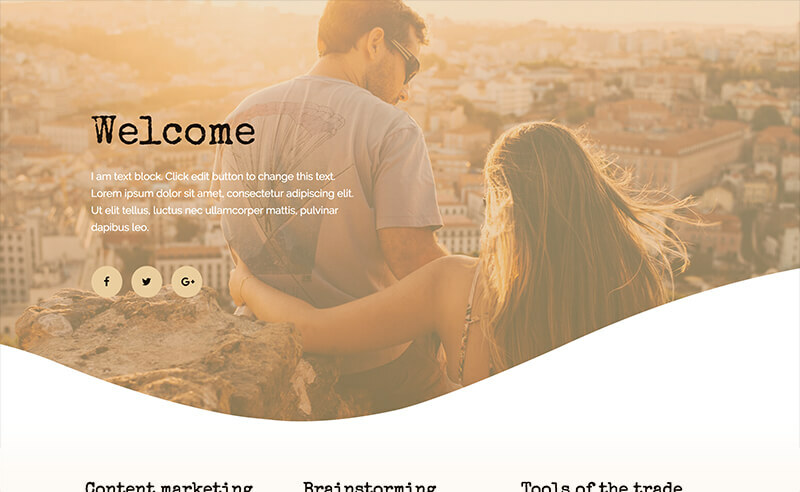 Today we are excited to introduce Shape Divider – a new refreshing design feature that will transform your pages and help you create beautiful professional looking designs. Here in Elementor, we not only follow top design trends, we also set them. Shape Divider is a perfect example of that, as it broadens the range of design possibilities considerably and allows you to create cool separator effects, that until now were simply not possible. We really fell in love with this feature. So much so, that we decided to release it to the entire Elementor community, and not just to pro users. We are starting off with 18 shapes you can choose from. These are starter shapes, that can be customized to create an endless and versatile array of dividers. The Shape Divider feature uses highly optimized SVG shapes, that are manipulated and customized on our frontend editor. When we developed this feature, we had two important guidelines we focused on: making sure the shapes were lightweight and optimized, while delivering shapes that looked great on any screen, resolution and device. Besides making the shapes lightweight SVG files, we have also made their loading asynchronous, meaning they only load when you need them to, and after the page has finished loading, so it doesn’t affect page speed. Because the shapes are SVGs, this guarantees they are always seen as high resolution, including on retina screens. Mobile editing: You can quickly customize a different shape to fit desktop, tablet and mobile screens, using Elementor’s Mobile Editing feature. 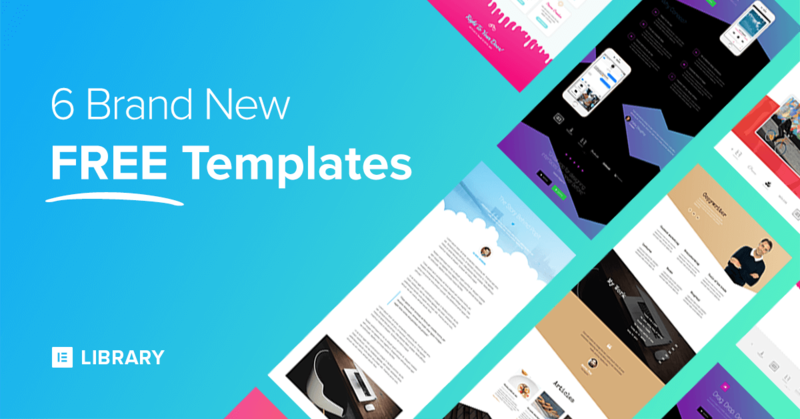 6 Shape Divider Templates to get you started! We want you to get the fastest introduction into the shapes feature. This is why we’ve created 4 stunning FREE templates, that showcase a few creative ideas for using shapes. 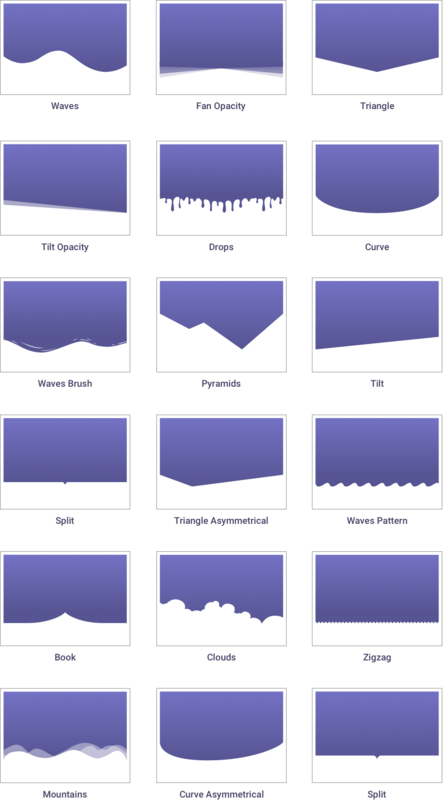 If you’re a Pro user, you get 2 more shape templates that are no less stunning. You are invited to use these templates for your own website, and tinker with the shapes to get to know just how easy it is to use. Because the new shapes feature is so substantial, we won’t elaborate much on the other features added to Elementor this week. Hopefully, we will be able to publish a longer post depicting them in more detail further ahead. In the meantime, here is a quick update on all the other improvements added to Elementor with this release. Video Lightbox – You can now add a video lightbox modal, so when the user clicks on an image, the video opens as a lightbox. You can visually control various design settings of the lightbox. To see the video lighbox feature, make sure you add an image overlay to your video widget. Button Shadow – We added box shadows to Elementor back in July, and if I am not mistaken this feature is still only available on our builder. Now, you can also add shadows to buttons. How cool is that? 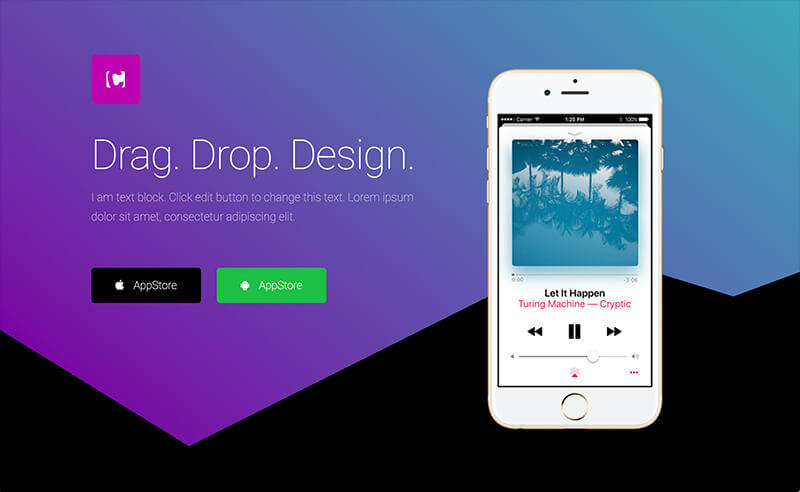 Smooth Scroll – A few months ago, we introduced smooth scrolling to our anchor widget. 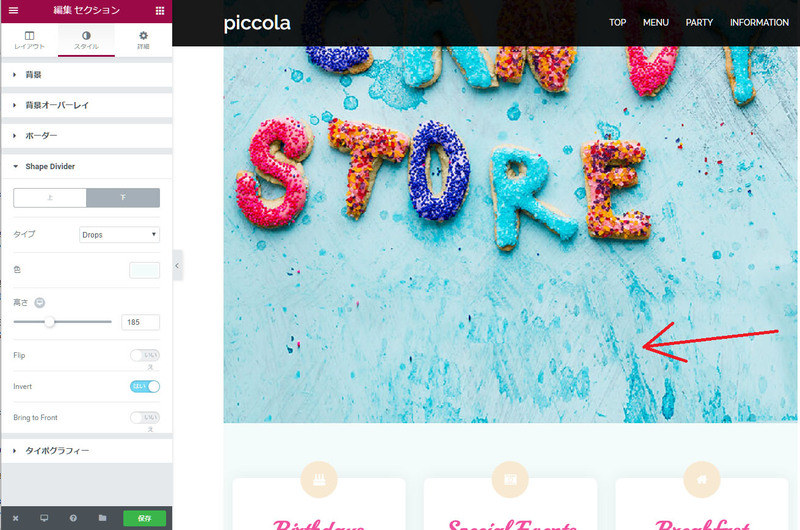 This way, you can create a one-page navigation that moves from section to section smoothly. Now you can use an ID to add smooth scrolling to any Elementor element: section, column or widget, without having to use the Anchor widget. Icon List Dividers – As per many of our users’ request, we have now added the ability to separate the different list items with lines and spaces, and design the line style however you like. We have also fixed an issue where list items which were longer than one line wrapped around the icon instead of getting aligned one below the other. Optimization Improvement – Without getting too technical, We’ve made sure JS scripts are included in the page only if you are using them. This means that your page only loads the widget JS scripts it needs, making Elementor pages load even faster. Note: If you’re a developer, follow this code example to understand how it works. Shape Divider has been added to a list of features we have added since the beginning of the year to the Free Elementor Page Builder, including Revision History and Gradients. We invite you to take the new Elementor version for a spin, and share some of your creative shape divider pages with us. Awesome! Shapes have become a huge part of my branding. It’s great to see more options now for my current and future websites. ? Wow, blown away by this feature! Great stuff!! 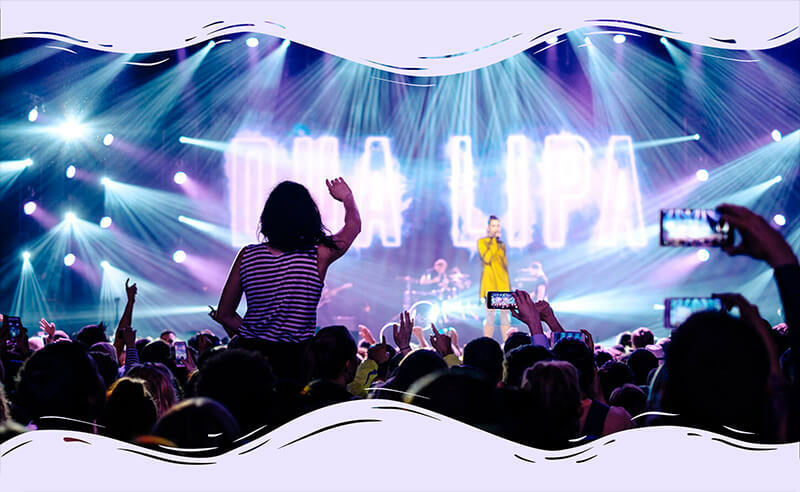 Question: with the shape dividers, is it possible to have full width video above the divider (like in a Revolution Slider) and a parallax full width image below the divider such that the shape divider cuts into the full width image below it (I assume the full width image is in the row below)? Simply amazing, keep up the great work ? Can we add our custom svg designs? Any discount for pro version ? I asked the same question before I used pro. Now that I’m actually using (without discount), I feel ashamed for ever asking. Not that you have to, I’m just saying the price they ask is WELL worth it! This is another awesome feature. Thanks! Wow! This makes adding shapes so incredibly easy. Thank you!!! That is brilliant! I can now forget visual composer even exists. Looking to upgrade to pro soon. Excellent! Elementor taking it to the next level again! I’m going to try it out today. That fact that you have so much control over it is awesome. I’ve just updated my pro version, but couldn’t see this feature. Isn’t it yet available? Or am I missing something? I did, but I can see only shape EAE Shape Separator. Sorry, I just figured out shape divider appears when editing the style of a section. I thought it was a separate widget like Shape Separator. Oh boy, how stupid it was of me! Fantastic feature! 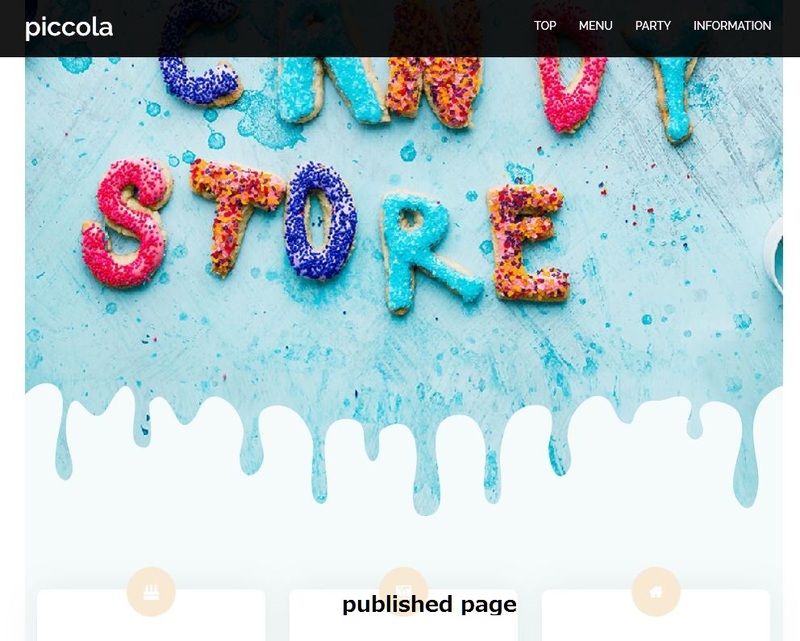 best page builder on the market! Looks good Ben and plenty to choose from. Plus “6 Templates to get you started!”! Thank you so much for the update! It’ll definitely come handy very soon. I have updated the free version but can’t find Shape Divider anywhere? Elementor is awesome and just keeps getting better and better. Thank you guys. Worth every cent! Is the shape separator behind the overlay background, why? I’ve been using elementor since beta, and purchased the pro (worth the money) since the first launched. I knew I didn’t chose wrong choice when I picked Elementor as my page builder. And off course this shape divider is another warm welcomed addition! can’t wait to play with it. Now now..I hope someday you guys would consider another feature such as blurring object when hover an image, particle and another fancy parallax effect. Elementor is getting better and better, thanks a lot for this shape divider feature. Can you use Revolution Slider with Elementor yet? You guys keep hitting it out of the park. I preordered the pro version before it came out due to how impressive elementor was at the time. All I can say now is ‘WOW’. Plus your support team is amazing. You really are the builder to beat and every one else is trailing behind. Congratulations and keep up the good work! Loving your work guys. Keep it up. I am not prompted to update the free version, only the pro version. So I deleted the free version and re-installed it. When re-installing it, WordPress lists the free version as having been updated 7 days ago, not yesterday. Going to Section > Style, there is no option for “shape divider”, only the “background”, and “background overlay”, as before. I updated both std & pro in the WP plugin section, however at the top of the ‘Edit Page’ it says “Update Elementor Now”. Also, in the Elementor editor, under the section styles, i am not seeing the ‘Shape Divider’ option. But when I go to section setting and style, I didn’t find the Shape Divider? Latest Version is 1.3.0 The WP repository hasn’t updated yet. I’m a little confused as you open the post with “So much so, that we decided to release it to the entire Elementor community, and not just to pro users.” yet the currently available version was released 7 days ago and is 1.2.4 – I even tried downloading from the site here and was delivered 1.2.4 that doesn’t have any of the new features and is the same as released on WordPress 7 days ago….? Many thanks – love the plugin, it’s stunning. Downloaded elementor. 1.3.0.zip 1.3.1.zip still cant find this new feature, and I have been to settings and no luck given up! Disable Global Colors	Checking this box will disable Elementor’s Global Colors, and make Elementor inherit the colors from your theme. Disable Global Fonts	Checking this box will disable Elementor’s Global Fonts, and make Elementor inherit the fonts from your theme. You’re in the wrong place. Hover over the section in the page itself. You will see a blue border around the section. Click on Section. The left panel will show the section settings. Then go to the style tab. Yes you was right I was looking in the wrong place. I went to add section clicked edit and then style and it is there. I had absolutely no problems. The available update showed up yesterday in my WordPress plugin section. Great. What’s the best module to put it in? This new feature is simply amazing! The whole plugin is fantastic! Thank you guys! Okay, I was able to update the free version of Elementor today, although it wasn’t available yesterday (after I saw this video). There is an issue. Everything looks great when I’m using shape divider on Elementor; on the right side of the screen, you can see that the feature should be fitting just fine into the bottom of the section. HOWEVER, when you open the page in a new tab (in chrome), the shape divider is literally upside down. It is still at the bottom of the section, but since it is upside down, it does not smoothly transition from the section to the next color. Instead, there is the background video, then the shape divider (white), then more background video under that. I’m experiencing the same problem with any shape I try at the bottom of a section. Looks great when editing with Elementor, then is upside down when viewing anywhere else. I can confirm that the shape divider is upside-down on both of my sites. So the triangle shape divider, for instance, is not resting on its base, but it’s flipped over and resting on its point. Again, it looks fine while you’re still working within elementor, but the problem appears when you refresh the page in a new tab. I can confirm the same situation; while in the “Elementor” building page the effect works as intended. After loading the final page in a separate browser page the effect is gone. Thanks for the suggestion, but this seems like something rather marginal in demand. with Sydney theme, no shapes appear on the edit screen. Other several themes are OK.
What are the 6 new templates? I have only found 5, which am I missing? Maybe I just have not found it yet ? But how would you do this easily ?? Maybe I should go for the Pro Version and should look there ? There you have a Pro Template with a Coffe Shop price-list… How is this done ? Via Tables or do you have more sections there that replace HTML table tags ?? 1.Inside the Picture box there is no Editor for the text and how do I put the picture below the text ?? 4×4 matrix section ?? So that I have ONE background picture for the frame of the 4 x 4 Buttons ? 1. I suggest you use the image widget and a separate text widget. 2. Use the columns widget. 3. This might be a conflict you are experiencing yourself. Please contact our support. 2. using chrome I have no realtime view of modifications. What a great feature again … for free …. I like Elementor, installed plugin, I try it, But No work. Why? Please explain! That’s a great feature I remember I made the string translation too but I cannot find it in my elementor, even in the pro version. I have the 1.3.4 installed. Where do I have to find this Shape Divider? Thanks! I found it and also adjusted some string translations. HAS THIS ISSUE BEEN RESOLVED? Can someone please tell me if the problems reported above about their divider showing “upside down” on viewing? Ie; was fine within Elementor but not on the final result? Thanks Ben, I’m now so excited about playing with it all that I think I’ll be awake all night! I’m not a dev – Elementor is wonderful for me – although I do still need to go through your tuts to give me confidence. I have so much DESIGN to get out of my head! Thanks for making it possible :))) you R O C K! can you include the table builder? i need to put simple with formatting and but i am unable to do that? We currently don’t have a table builder. You can try a third party plugin. wow awesome… i like this features .. Excellent tool. One of the best…..congrat. Waiting for discount code to go pro. I downloaded the plugin, however it is not yet with the divider shape, is this tool only for the pro version? Am I able to upload my own svg shape file? I cannot delete a shape divider. It does not show up in elementor but it does in the wordpress customize area. How can I delete this? Hey Ben, do you think you will be adding more shapes to this awesome list? Is it possible to design our own svg shapes? or is that too difficult to implement? and if so is there a tutorial on this? Also whats your though on png image dividers? Last but not least would love to see you add header and footer options like fly in and overlay navigation in house. What an awesome plug in. We probably won’t add new shapes in the following releases. You can create your own shape dividers using out API. Is it possible to add my custom svg shapes? It would be cool if you could do a fade at the bottom or top for a shape divider. Fantástico, es lo mejor que he visto últimamente. Elementor jamas deja de sorprenderme. Is it possible to have shape divider RIGHT and LEFT? I want to have a pointer pointing to the right. Are we able to add our own shapes? If so, where can I do that? Is there a way to make them vertical? Is it possible to create your own dividing line shape? Loving this feature guys, continually impressed by Elementor!